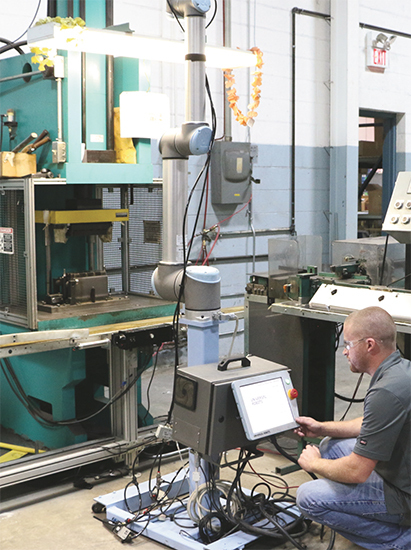 At Scott Fetzer Electrical Group (SFEG), near Nashville, TN, collaborative robots are placed on wheeled pedestals, enabling them to move quickly between tasks. Here, after performing pick-and-place at an SFEG stamping press, a robot is set up to tend a box folder and fastener press. This mobile 10-kg-payload robot is being deployed at a stamping press in SFEG’s sheetmetal department. Scott Fetzer Electrical Group (SFEG), a high-mix, low-volume electronics manufacturer in Fairview, TN, was formed in 2010 to bring together the capabilities of three company businesses: France Power Solutions, Northland Motor Technology and Kingston Products. To propel the new entity, which manufactures transformers, power supplies, motion controls and drive systems, SFEG sought ways to become more competitive on a global scale while taking advantage of its existing machinery. The company employs all manner of equipment, including stamping presses, press brakes and benders, turret punch presses, welding machines and cutters, to go along with its assorted assembly machinery and systems. What’s one way to become more efficient, productive and, thus, competitive? SFEG found an answer: robots. More specifically, collaborative, mobile robots that work alongside people and machinery to handle a variety of tasks. Universal Robots’ product portfolio includes the UR3, UR5 and UR10 robot arms, named after their payloads in kg. All feature 0.1-mm repeatability and span in reach from 19.7 in to 51.2 in. Force-sensing technology stops the robots from operating when encountering an employee, eliminating the need for safety guarding in most scenarios where prior risk assessment deems the robot safe to operate in proximity to humans. That’s a break from traditional industrial robots that usually stay hardwired behind safety guarding, fenced off from people. When the first UR5 arrived at SFEG in August 2014 along with another robot, it quickly was named Waldo, inspired by the popular “Where’s Waldo” books featuring a friendly fellow that keeps appearing in new places amongst crowds of people. “One day Waldo tends to sheetmetal-bending machines, the next day he performs pick-and-place tasks, and the third day we take him to Manufacturing Day at the local high school,” says Bush. Before the first robot delivery, Jamie Cook, principal engineer at SFEG, says that he was “antsy” about the new collaborative technology, having never programmed cage-free robots. All programming is performed through UR’s touchscreen pendant. The robot arm can be directed via arrow keys on the touchscreen or simply by grabbing the robot arm and teaching it the desired moves between waypoints. That eliminates the structured text programming Cook usually had to code when working with traditional robots. The first collaborative robot arriving at SFEG, with 5-kg load capacity, was named Waldo, inspired by the popular “Where’s Waldo” books featuring a friendly fellow that keeps appearing in new places amongst crowds of people. The name speaks to how SFEG associates view its mobility and flexibility in performing tasks. Happy with its initial robot acquisitions, SFEG added 12 more in December 2014. The company places its robots on pedestals with wheels, and is building a fleet of mobile UR robots for deployment throughout its sheetmetal department. Here, the robots integrate with the entire production cycle, from cutting the initial blank on a blanking press to forming, folding and final assembly of electrical components. Additional robots are planned to help tend turret presses and press brakes. The collaborative robots have improved production efficiency by 20 percent, according to Bush, while taking over monotonous and potentially hazardous tasks. Displaced employees now are reallocated to more rewarding jobs in other production areas where the company has seen growth, or to fill holes due to natural attrition. With the productivity rise, SFEG is experiencing a 12 to 14-month return on investment per robot. The collaborative robots come with touchscreen pendants for simplified programming. Associates program a robot arm via arrow keys on the touchscreen or simply by grabbing the robot arm and teaching it the desired moves between waypoints. Robot success stories abound at SFEG, with the units performing a wide variety of jobs. Again, as SFEG looks for tasks to automate, eliminating monotonous and potentially dangerous manual labor is the number-one priority. For example, two robots work on the motor-field line, a UR5 and a UR10. The UR5 robot is placed at the end of the line next to an employee that hands the robot a motor-field part. The UR5 picks the part and places it in a holder, picks up a wirecutter to trim the wires, and then places the part for the UR10 robot to pick up and place on a conveyor for final assembly. Working in tandem, the robots communicate their positions to each other through Modbus socket connections. The company’s transformer line is another where the robots have proven productive. 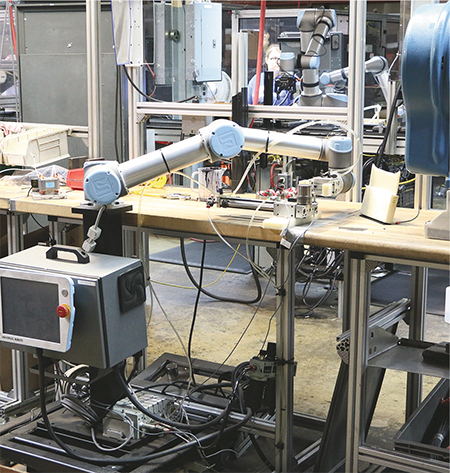 One new application employing the robots for data collection is in the live testing of new designs, where a small motor manufactured at SFEG is placed in a customer’s product. “We then use one of our mobile robots to turn the product’s switch on and off, running it for a minute on, 30 seconds off, for the next 400 hours,” says Bush, noting that the robot collects data pertinent to the test such as max amperage, average amperage and the number of cycles completed, and transmits that data to a data-storage system. “It’s a quick way for us to perform lifecycle testing. We didn’t have to set up a lot of equipment; the initial program took us only about 5 minutes to create. Of course, bringing robots into a production environment can cause anxiety, but employees at SFEG are buying in after initial hesitation. The wire-cutting application provides a perfect example. The wire-cutting UR5 working in tandem with the UR10 has been embraced by the staff, which named the robotic team Thelma and Louise. According to Sebrina Thompson, line lead at SFEG, the names were chosen initially because personnel thought the robots would take their jobs–essentially driving them off a cliff just as Thelma and Louise did in the movie. As for operating the robots, Thompson says it’s easy. In addition to current efforts in metalforming operations, SFEG also is looking closely at its assembly operations for more robot applications. 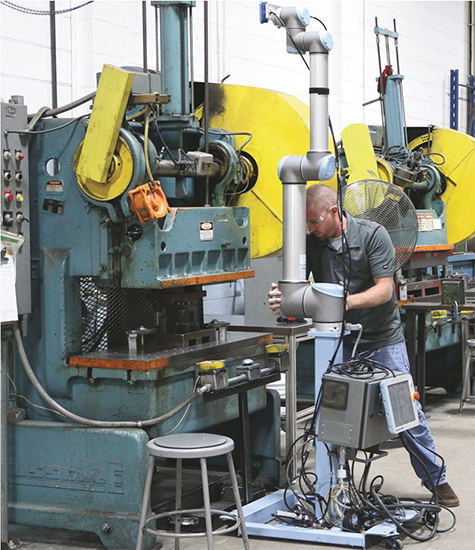 And, according to Karl Bentz, sales engineer at Cross Automation, the Southeast-U.S. distributor through which SFEG purchases the URs, interest in collaborative robots is increasing.